Time-to-event data, such as time to death or time to first seizure, are commonly used outcomes in medical research to summarise the length of time taken for a particular event of interest to occur. 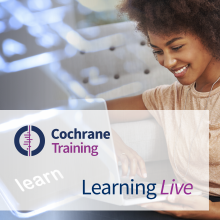 In these videos, originally part of the Cochrane Learning Live webinar series, Catrin Tudur Smith explains how to undertake a meta-analysis of time-to-event data. Methods for analysis of time-to-event data need to account for both the time to event and any related but unobserved events. Meta-analysis of time-to-event outcomes can be undertaken using data extracted from trial reports using a variety of different methods that will be described in this webinar. The webinar was delivered in July 2018. Below you will find videos from the webinar, the accompanying slides to download [PDF], the practical and the solutions. Catrin Tudur Smith, Professor of Biostatistics, Department of Biostatistics, University of Liverpool, UK; Co-convenor of Cochrane Statistical Methods Group.